Barcelona can be divided into several “zones” — not only concerning space, but also regarding time. The first can be attributed to the ancient city, when the colony Barcino was founded by the ancient Romans, and the further development of the city during the Middle Ages. So both the ruins of Roman buildings and medieval houses as well as Gothic temples can be seen in the Gothic Quarter. The second zone corresponds to the Modernism — starting in the 19th century. This is basically the time of the Catalan modernist style, and of course Gaudi. Here we will explore the Eixample and go up to Park Güell. The third zone covers everything else (in our case, if we run out of time, Barceloneta and Montjuic are really worth visiting). 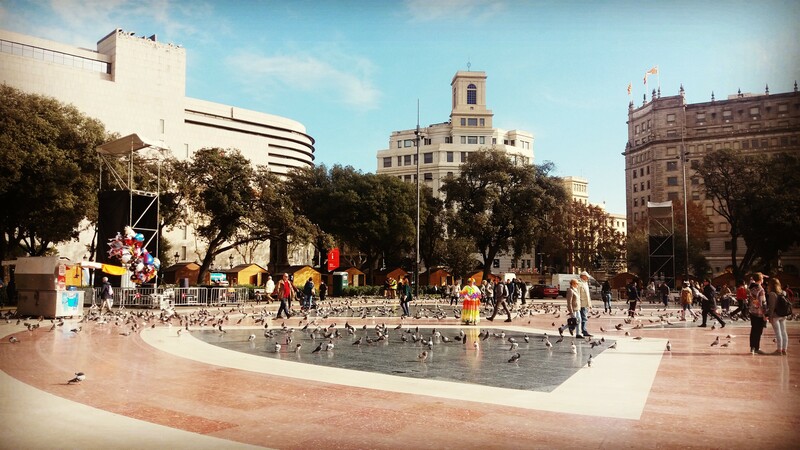 Start the day on the Plaça Catalunya, which the central square of the city and very convenient to start any route. The main Cathedral of the Holy Cross and St. Eulalia, the Basilica of Santa Maria del Mar, the Basilica of Santa Maria del Pi — they are all very close to each other and are excellent examples of Gothic architecture. All these ancient cathedrals date back to 13th and 14th centuries. Just imagine how many stories and events they have witnessed! Gothic buildings, both churches and residential buildings and palaces, had one interesting feature: they had an open-air courtyard inside. In these courtyards you can find fountains and lush vegetation, as well as silence, tranquillity and relax while listening to the sound of water. A great number of these picturesque courtyards can be found on our hunts Romantic Barcelona and Lost in time. Located in the centre and considered the most ancient market of the city, this market attracts thousands of tourists for a reason. Here you can disconnect and enjoy fresh fruits and juices, taste local delicacies like “turron” or “jamon”, and even have some tapas for dinner at one of the market stands. The largest park in the city center and the most popular among locals, full of green and attractions. Only here you can see a mammoth, the castle of Three Dragons, the fountain-cascade Birth of Venus... and you can also arrange a picnic on the grass near the pond! Our best hunts for this day are: Born in el Born: neighborhood stories, Romantic Barcelona, ​​In the Gothic labyrinth. Quests will allow you to go through a carefully designed route through the most interesting places, to avoid getting lost, and to get acquainted with local culture and history. The main attraction of Barcelona, Sagrada Familia is incredible, the greatness of this temple and the imagination of Gaudi are breathtaking. Make sure to buy a ticket and go inside to admire the wonderful play of lights in the magic stained-glass windows. You won’t see anything like this anywhere else! It is better if you buy your ticket in advance on their website - this will help to avoid queues and to plan your day better. Also make sure to return to the cathedral in the evening, after sunset, and go to the park in front of the Nativity Facade, on the other side of the pond. From there you will see an amazing mirror image of the Sagrada Familia on the dark water! We advise you to grab a bottle of wine and sit on a bench specially set up to stare at the cathedral, while enjoying its magnificent view. Great plan for a warm evening! Paseo de Gracia is a boulevard in the city center, the main shopping street, the equivalent of the Champs-Elysees in Paris. This wide street in the new district attracted the rich people and aristocrats of the city of the late 19th - early 20th century. To show their wealth, they hired the best architects of their time, turning the facades of ordinary houses into works of art. Among them, of course, are Gaudi's houses: the famous Casa Batllo and Pedrera. However, in addition to these two, don’t forget to look at Casa Amatller and Casa Lleo Morera, one standing next to the other and as if they were competing for the beauty. One fun fact is that this quarter is called the "Apple of discord" (Have you ever heard of the legend of the three ancient Greek goddesses who decided who would get an apple with the inscription "To the Most Beautiful"?). So here instead of goddesses, architects would compete with their houses. If you want to learn about Catalan modernism and its most outstanding masterpieces, we recommend you to try our quest Modernist Barcelona. Within 2-3 hours you will go from Plaça Catalunya to Hospital Sant Pau, and thanks to the game you will get to know all the details, curious facts, and urban stories. This narrow, picturesque street starts right behind the old building of University of Barcelona (which you should pay a visit to see its courtyard, available for visiting all year except in August). On this street you can find a great number of bars, restaurants, cafés, ice cream shops… basically suitable for any meal throughout the day. This park is not in Eixample, but since you’re spending the day getting to know the creativity of Gaudi, you can’t skip the park! You should take at least 2 hours to visit it. The park is divided into two parts — one which you have to pay for (again, we recommend you buy your tickets in advance to guarantee the visit), and another part which is larger and free, where you can see Gaudi’s unusual avenues, columns resembling trees, and some of the best views of the city! On the third day, after seeing all the main attractions, you deserve to enjoy the beach! Go to the Barceloneta, the ancient fishermen neighborhood, which is also great to investigate during our treasure hunt! You can calmly stroll along the harbour, feel the sea breeze on your skin and inhale the smell of sea and fresh fish. After having had lunch in one of the restaurants, you can head to Montjuic. You can get there by the funicular railway directly from Barceloneta, which is also a great way to enjoy the views of the port. If not, you can take the bus, which is cheaper and more common. In Montjuic you will see many parks and a castle, as well as beautiful views of the port, the city, and even the airport. Note that from the observation deck of the castle you can trace the landing of an aircraft right up to the touch of the landing gear! While going down to Plaça d’Espanya, you will find on your way the Olympic Stadium and the Museum of Catalan Art, which has another wonderful view of the city. You might want to stay until the evening, if you want to see the Magic Fountain of Montjuic. So as you’ve seen, you can visit all the main attractions of Barcelona in three days!